It’s my 50th Birthday today. Well, as I type this, it’s actually a couple of weeks before my 50th, but this entry is scheduled for my birthday, so I thought it was worth mentioning. I bought my first VCR in December 1984, one of my first large purchases after starting full time work. Our family had never had one – I don’t think my parents were big TV fans, it was just something that was on in the corner sometimes. But I loved TV. When I was 12, and we had got a new colour television, I persuaded my dad to let me have our old black and white TV in my bedroom, and to his credit, he let me. I’d watch things that wouldn’t normally be family viewing downstairs – The Sweeney was one I particularly remember watching on it – and I would always watch when the BBC showed the old Universal monster movies. I saw Citizen Kane for the first time on that old B&W screen. When I was about 18, we had a family holiday in Galway, visiting the Irish side of the family. We stayed at our Uncle’s house – and they owned a VCR. This was huge for me. I signed up at the local video rental shop in town, and would rent two or three films a day. It was a huge shop, and had a big Betamax section as well as the usual VHS films. But, more importantly, this was Ireland which had not, recently, passed the Video Recordings Act, which, in the UK, led to the banning of an awful lot of horror films on video. This didn’t affect Ireland, so, for this particular summer, I was able to rent films like The Evil Dead, The Burning (pretty bad), Cat People, Videodrome and other, safer fare like Poltergeist. My family couldn’t understand why I’d rather stay indoors all day and watch films on video. But it was one of the best holidays I’d ever had. When I bought my VCR, I’d imagined I’d keep overwriting the same three or four tapes. This notion lasted maybe a week. I found that if I was interested in recording something, chances are, I’d probably want to watch it again. Thus starting my inexorable slide towards the current state of affairs, which is a garage half full of boxes of videotapes. So, on this arbitrarily even birthday, let’s see what I’m writing about. You can’t beat Thunderbirds. Peerless miniatures, huge explosions, ludicrous countdowns and one of the greatest theme tunes in the history of television, courtesy of the highly underrated Barry Gray. Yes, you could see the strings, but that doesn’t matter. It has one of the greatest premises of any TV drama – a concept that never requires a villain. Oh sure, it does sometimes feature a villain in its stories, and is no worse for that, but the core concept of the show doesn’t require one, and a whole show can run where the worst thing anyone does is act carelessly (to cause whatever the disaster is). And those craft. Just beautiful. 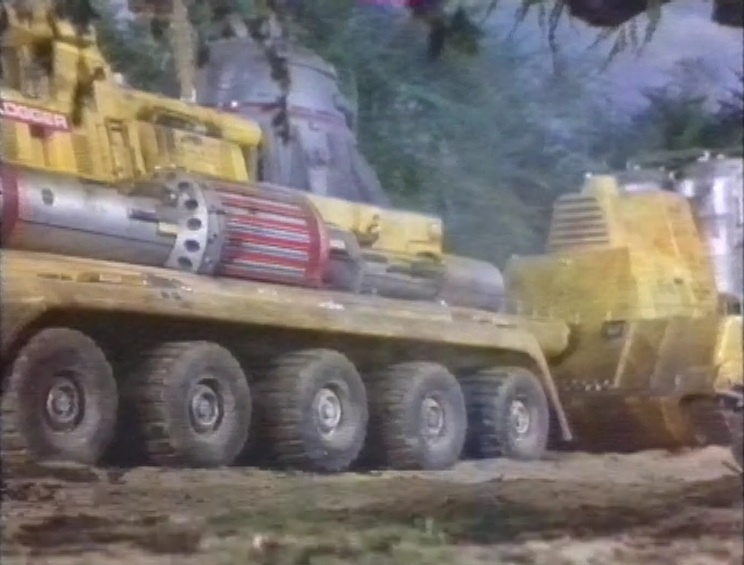 Gerry Anderson shows always had fantastic vehicles – hell, Thunderbirds is even named after the vehicles. But UFO had loads, as did Captain Scarlet, and Space 1999 had the Eagle Transporter, one of the greatest ship designs in TV. When Thunderbirds was shown at lunchtime on Sundays, I’d take my Sunday lunch into the living room so I could still watch it. I remember the thrill of seeing an episode in colour, when we visiting our rich cousins. So it’s nice that Thunderbirds happens to be the tape I’m talking about today. Which episode do we have? This tape was obviously one that I did overtape, as I spot two different recordings before Thunderbirds – one of them an adaptation of a Muriel Sparks novel. Memento Mori, possibly, or maybe The Prime of Miss Jean Brodie. We shall see. But it’s soon obliterated by Thunderbirds – and an episode already in progress. I hate it when that happens. Here’s the first thing we see. Quick! Which episode? Might be hard to tell from this angle, but that’s the Crablogger, an automated deforestation machine, that naturally gets out of control. The episode is Path of Destruction. It’s typical of the series that the machine goes out of control not because of malice but because the men running it succumb to food poisoning. This episode is particularly memorable for me, mainly because of the score – there’s a very specific theme for the Crablogger which I don’t remember being reused in other episodes. The aircraft Skythrust, conceived by Brains, falls into the hands of fashion criminals who hi-jack the plane to steal a new French design from the renowned François Lemaire. That’s right. Fashion criminals. After the secret new fibre, Pennelon, named after Lady Penelope. Can you see now why I love this programme. After the second episode, there’s a trailer for The Comic Strip Presents: The Crying Game. And there’s a strange, SF-inflected teaser for the BBC One World season. This recording stops just after this, and underneath we get an older recording. Michael Hordern and Maggie Smith, Thora Hird, John Wood. The credits reveal the answer to the question we had earlier – it’s the BBC adaptaion of Memento Mori. 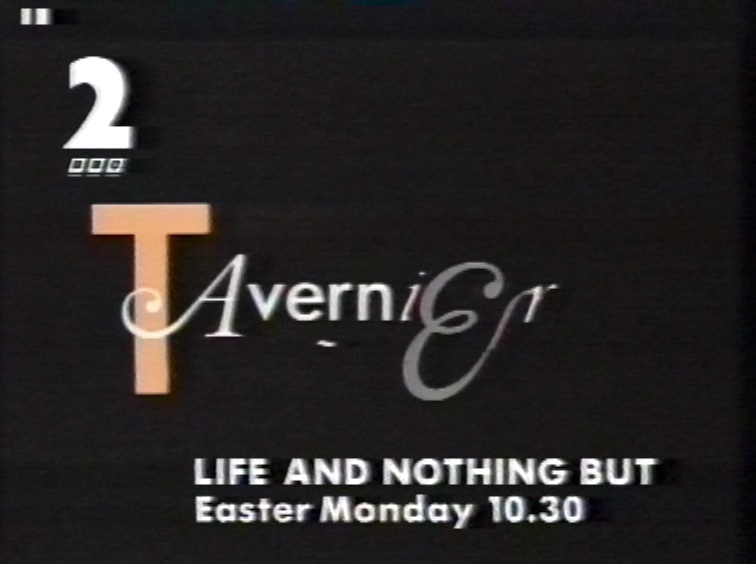 Following this a trailer for Bertrand Tavernier’s Life and Nothing But. I think someone in the graphics department got a new set of fonts for Easter and has gone a bit mad. There’s a trailer for Mr Wakefield’s Crusade, featuring Doctor Who himself Peter Capaldi. Only joking, it’s Snooker, introduced by David Vine. Apologies to all you Sporters out there, but that’s a blind spot for me. It’s the World Snooker Championship. There’s quite a lot of this snooker programme before that recording also ends, and underneath is an old film. 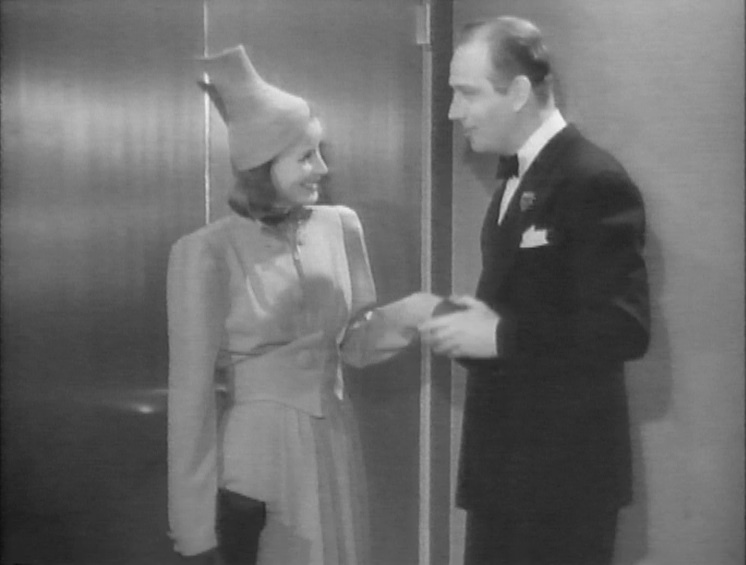 I don’t think I’ve ever seen it, but that’s Greta Garbo, so my immediate guess was Ninotchka, and an image search confirms it – that hat is unmistakable. There’s quite a bit of this film before the tape finally ends.